The 2017 Mini Countryman just might be the angriest (and potentially ugliest) little car ever mass produced, so at least now there’s the John Cooper Works Countryman to make it much more fun to drive. The speedier Countryman will get the same turbo 4-cylinder across the John Cooper Works lineup, good for 228 horsepower and 258 lb-ft of torque. The JCW trim comes with Mini’s All4 all-wheel-drive in a sportier suspension setup, with bigger wheels and Brembo brakes as standard. It’s available with either a six-speed manual or eight-speed automatic. The inside is also nicely loaded with standard features like a backup camera, parking sensors and a nice big moonroof. The zero to 60 miles-per-hour time is 6.2 seconds, and if the driving experience is anything like the “normal,” giddy and crackling Mini John Cooper Works, it just might make up for the mean-mugging up front. I never really got used to the odd juxtaposition of weird plastic trim pieces coupled with BMW-quality leather inside the Mini JCW I was in a few months ago, but damn if I didn’t enjoy driving it. 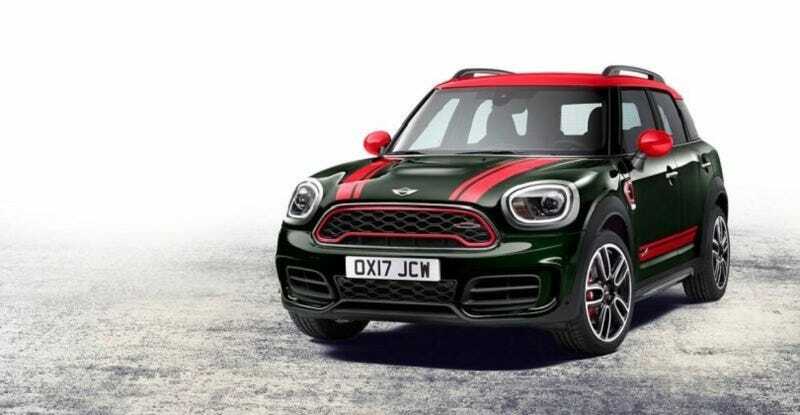 This new JCW Countryman should go on sale this summer. All I can imagine is Grumpy Cat getting into the catnip when I look at this thing.